Knowledge is the key to being a better printer and having a profitable business. We off a complete line of books and DVDs on every part of the garment decorating process. Plus we also do consulting! The NEW 2012 Edition of How To Print T-Shirts For Fun And Profit - Download Version - This is the same book that changed the industry - only it is now in digital eBook form. How To Print T-Shirts For Fun And Profit covers everything from A to Z about screen printing T-Shirts and Heat Transfers, and includes sections on printing Nylon Jackets, Baseball Caps and more. This is the book the industry talks about. It is responsible for getting thousands of T-Shirt printers into the profitable garment printing business! The NEW 2012 Edition of How To Print T-Shirts For Fun And Profit. This is the same book that changed the industry - only it is now in digital eBook form on a DVD. How To Print T-Shirts For Fun And Profit covers everything from A to Z about screen printing T-Shirts and Heat Transfers, and includes sections on printing Nylon Jackets, Baseball Caps and more. This is the book the industry talks about. It is responsible for getting thousands of T-Shirt printers into the profitable garment printing business! Every successful shop has a "well used" copy of this book. This is a great starter package. Save $200 over individual list prices! You get all the training you need and you get our popular T-Seps color separation software and T-RIP for film output. Simply add an inexpensive inkjet printer like the Epson 1400, get a copy of Adobe Photoshop, and, buy or make a printing press, exposure unit and dryer or flash unit. The only thing left are a few supplies and customers! If you are just starting out this is almost all you need! Over 20 hours of video and the book How To Print T-Shirts for Fun and Profit to go along with it. Sit back and learn everything from how to print, to computer graphics, the business and marketing side and much, much more.Start to do high-end color separations. You asked for it and here it is. Save $75 over individual product prices! All of our most popular DVDs and book on one package. If you are just starting out this is almost all you need! Over 20 hours of video and the book How To Print T-Shirts for Fun and Profit to go along with it. Sit back and learn everything from how to print, to computer graphics, the business and marketing side and much, much more. If you like the "cooking shows" you will love this DVD. Charlie shows how to paint, roll, spray and use other methods to really give the shirt a "treatment". If you are starting your own business or need a refresher or training for employees - this course is what you need. Learn how to screen print T-Shirts from industry veteran Scott Fresener and his son Michael. From "this is a T-Shirt," to creating color separations, and making a multi-color print - you get it all here. 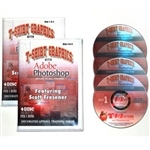 Adobe® Photoshop® is the number one image manipulation program! Now you can do your own process color separations IN HOUSE and save thousands of dollars every year. Why send out your process jobs when you can learn what the separators know. With this step-by-step course you'll learn all about image manipulation, halftones, color correction, proper scanning, unsharp masking, special effects filters, creating process separations AND spot color separations, how to create a white plate, basic dark shirt separations, adjusting separations for specific inks, undercolor removal, tone curve and levels adjustments, action palette, and EVERYTHING THE MANUAL DOESN'T TELL YOU! Corel Draw is the world's number one vector based drawing program. 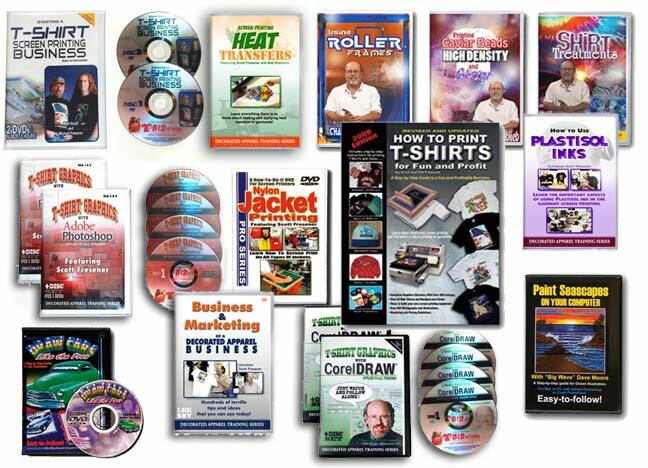 If you want to learn how to do T-Shirt graphics with Corel and learn 100's of tips and tricks that ARE NOT in the manual, then you need this DVD set! Do you have questions on how to use your inks? The answers are here! This tape was shot live at the U.S. Screen Printing Institute and features Scott Fresener lecturing and demonstrating the use of Plastisol Inks. How To Use Plastisol Inks is a how-to-do-it DVD covering the important aspects of using plastisol ink in the garment screen printing shop. Running a garment printing business in a professional manner and good marketing are the keys to being a success and this course covers it all! Whether you are just getting into the business or are trying to make a profit in an existing business, this course is a must. It covers everything from creating your own catalog, to how to price your work, getting the larger accounts, getting credit, giving credit, all about the industry, trade shows, trade magazines and more. Have you ever wondered how they create those realistic car designs on shirts? The mystery is over with this 90 minute video by industry veteran and super artist, Dave Moore. Dave's nickname is "Big Wave Dave" because he spent years doing T-Shirt graphics for the famous Crazy Shirt line in Hawaii. Learn how to stretch the industry's popular Newman Roller Frames in an easy-to-follow step-by-step manner. This DVD includes manual stretching, using a stretching table and using pre-cut panels. Learn how tighter mesh and better screen stretching give you a superior print. Jackets can be very profitable. Now you can quit turning down those jacket orders. If you already screen print jackets this DVD will help you minimize your mistakes and teach you how to do top quality work. Salvaging just one or two jackets could pay for this tape! This DVD is very cool. If you like watching the TV shows where they show you how to paint a scene - then you will love Dave Moore showing you the tricks of creating a complete image in Photoshop. Learn the latest techniques for doing screen prints with a "feel" with inks such as High Density, Caviar Beads and Glitter with industry expert Charlie Taublieb. Do you want to screen print your own plastisol heat transfers for garments? This step-by-step DVD tells it all. Whether you want to print transfers for an event or just need stock designs for your retail store - if you are a screen printer they are easy. This video only covers standard screen printed transfers and does not cover digital inkjet printed transfers.